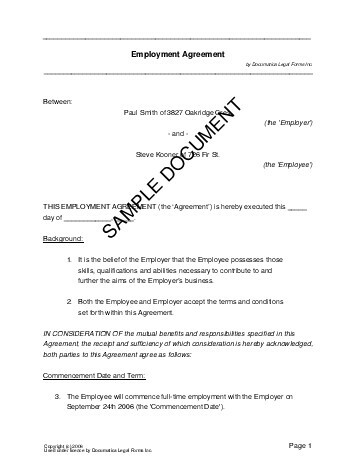 An Employment Agreement is used when an employee is hired or re-hired, and states the compensation the employee will receive, and any other terms and conditions of employment that may exist. Typically, employment agreements cover such topics as rate and frequency of payment, vacation time, confidential obligations (if any), benefits or stock options, termination period, and several related details. A probationary period is a time period at the beginning of employment designed for training and adjustment to the position. If the employee is not performing well, he or she may be terminated with or without cause. Will the term of the employment be indefinite? What will be the term of employment (e.g. 6 months)? When will employment begin (e.g. June 1st, 2019)? Will there be a probationary period? How will the Employee be paid? How often will the Employee be paid? Here, you can restrict your employee from competing (e.g. starting or helping to start a company/organization that can take away your business), soliciting (e.g. trying to recruit your workers or partners away from you), and disclosing confidential information (e.g. telling your business details or secrets to the public or to a competitor). Within what period is the Employee forbidden from competing? Within what period is the Employee forbidden from soliciting the employer's affiliates/employees? Within what period is the Employee prohibited from disclosing confidential information? Does the Employer wish to reserve the right to terminate this agreement if the Employee becomes disabled? Are there any additional clauses you wish to add? We strongly recommend obtaining an attorney reviewed Employment Agreement directly from us. The Employee will be employed as a _______________ and the place of business is ______________. This Contract will commence on ______________ and expire on _________________. It is expressly understood that this is a contract for a fixed term. Upon expiry of the contract, it is understood that the relationship between the parties has ended, with NO NOTICE period required. Should the parties wish to continue with the relationship, a new contract must be executed. The Employee shall be obliged to work such lawful hours as required by the Company up to ______ hours per week and as per the contractual agreement, included overtime work remunerated at the agreed rate. Notwithstanding the above, in the event of emergency work arising it will be compulsory for the Employee to work emergency overtime. The Employee will be remunerated at the rate of __________________________________________ as agreed at the time of your interview, for the hours worked as indicated in 4 above. any amount in respect of which the Employee's written authority has been given. any amount for loss or damage to the Company that the Employee has caused. This employments contract will terminate as outlined above with NO notice period necessary. This employment agreement and any exhibit attached constitute the sole and entire agreement. This contract will commence on, and continue until terminated as outlined within. The Employee is entitled to a ______ lunch break and ______________ (other) breaks. The Employee must serve a probationary period of three (3) months during which the Company will monitor the Employee's performance and progress. The Employee will be remunerated at the rate of _____________ for hours worked. in respect of which the Employee's written authority has been given. for loss or damage to the Company that the Employee has caused. Annual leave will be ______________ consecutive days. Sick leave will be ____________ days per year. For maximum legal protection, obtain a lawyer reviewed Employment Agreement directly from us.